The CEO of an ag startup based in Iowa City is predicting rapid growth of his business in 2018. 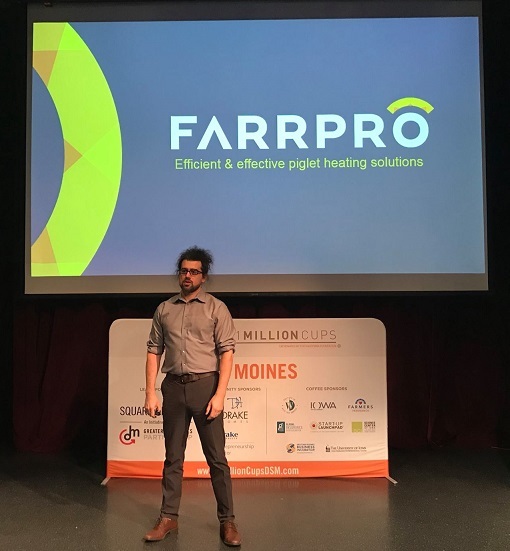 Amos Peterson is the leader of FarrPro, which has developed a replacement for heat lamps in farrowing facilities. The invention is designed to help pork producers reduce both mortality and energy costs. “It’s an enclosed micro-climate that evenly heats the piglets throughout the first three weeks of their lives,” Peterson says. FarrPro was part of the Iowa AgriTech Accelerator Class of 2017. The Des Moines-based program is designed to connect ag-tech startups with mentors and investors. Peterson says FarrPro is just now beginning a pilot project, but he calls the preliminary data on his product “very encouraging.” He says the piglets “seem to really like” the enclosures. Peterson says fundraising will be critical over the next year as he hopes FarrPro units will eventually be used by swine operations around the world. “The launch throughout 2018 – we’re hoping to sell about 1,000 units to early test partners and 10,000 through other distribution methods,” Peterson says. The Iowa AgriTech Accelerator will begin accepting applications for its Class of 2018 in January.